Football is back, baby. Sure it was just the Spring Game but, hey, we’ll take it! In the annual classic, Team Oregon (White) faced off against Team Pathway (Green). A full list of the rosters can be found here. While it was certainly no regular season game, players came out hard and fast. It was the team’s first game without many of the leaders from last year, most noticeably Marcus Mariota. The former QB, now a member of the Tennessee Titans, did make an appearance, though, to the joy of the crowd. Now, without further ado, let’s get to the notes from the game. No. 11 is back, he just decided to add the two 1’s together. Bralon freakin’ Addison: Welcome back, Bralon! 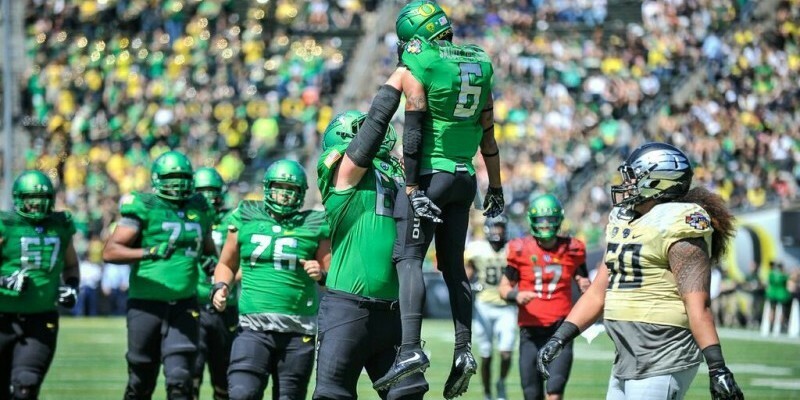 After a year of recovery following a gruesome ACL injury, the former star receiver looked every bit as good as Duck fans remembered him being. In the first half alone, Addison tallied 46 yards receiving and a TD, while also completing all three of his passes for 71 yards and a TD. Addison’s shining moment was a 42-yard catch and run where he broke multiple tackles while showcasing his elite speed. Jimmie Swain: A top recruit in 2013, Swain saw very little playing time during his freshman campaign. Well, now the 6’2″, 235 lb. linebacker is a sophomore and looking for playing time. Swain tallied a game-high seven tackles, making several great plays to stop big gains. The linebacker position was weak last season, but Swain is a possible bright spot for this year’s team. Jalen Brown: Another top recruit, Brown was one of the seemingly endless number of talented Ducks receivers last season. Although he didn’t see a whole lot of action, the plays he did make were outstanding. He only caught three balls but, with those three, he tallied 114 yards. He has big play ability, and will be just one more weapon for opposing defenses to worry about this season. Evan Baylis struggled mightily today. Evan Baylis: Baylis performed admirably filling in for star TE Pharaoh Brown last season, but he looked like a shell of his former self today. He dropped all the balls thrown to him, including a nice post throw by Taylor Alie. Needless to say, the return of Brown is eagerly anticipated. Ty Griffin: Word around the street was that Ty Griffin had been practicing really well, and was even looking to push for a starting job in the fall. If that’s the case, he must’ve been having an off day because Griffin looked awful. The Georgia Tech transfer completed just 4-12 passes, and threw an interception after being on completely different wavelengths from his receivers. Not a good day for Griffin. Any RB not named Thomas Tyner: Outside of Tyner, who averaged 9.4 yards per carry on five touches, Team Oregon’s RBs couldn’t move the ball. The worst of the bunch was Tony James who, in four touches, managed zero yards. James is projected to be Oregon’s third string RB, but outings like that aren’t going to turn any heads. Jeff Lockie looks like the early favorite…by a landslide. The Veterans: Jeff Lockie was a machine. That’s all there is to say. He completed all nine of his passes, threw for a game high 223 yards and three TDs, and even ran for an additional 16. He looked calm, made some tough throws, and simply was the best QB on the field. Another bright spot —Royce Freeman looked every bit as good as last season. Freeman averaged nearly eight yards per carry, and scored a TD on Team Pathway’s opening drive. Charles Nelson: This guy is just a freak. He played both sides of the ball and, honestly, it’s hard to say on which side he performed better. For the offense, Nelson racked up a game high 144 yards and two TDs and, on defense, he recorded three tackles and a spectacular over-the-shoulder interception while tight-roping the sideline. The guy was the best athlete on the field by a mile. Canton Kaumatule: Get used to this name, because it’s going to be everywhere. The five star recruit set the edge, rarely allowing any plays to bounce outside. He also appeared to be unblockable, recording 2.5 TFL and two sacks. 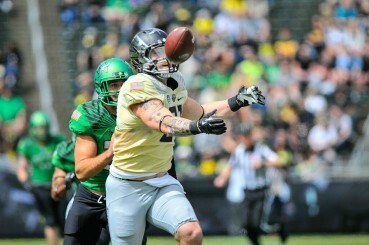 He was also tied for the team-high with five tackles. 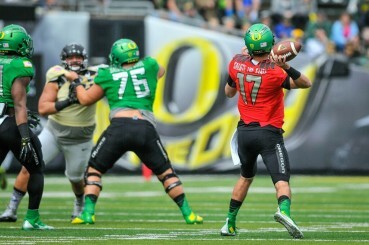 The loss of Arik Armstead hurt, but Kaumatule looks up to the task of replacing him. 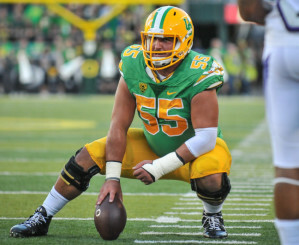 Morgan Mahalak: Mahalak was one of my favorites to win the starting job, but his performance in the Spring Game was mediocre at best. The sophomore completed just 3-9 of his passes, while also looking extremely uncomfortable in the pocket. He still has time to develop but, outside of Lockie, the QB position is looking shaky. Who will replace this guy? The Center Position: Low snaps, high snaps, and even an over-the-head snap that resulted in a safety were just a few things to note from the Spring Game. The blocking was also average at best, which isn’t good for a team losing three of its core offensive linemen from last season. Someone will have to step up to fill Hroniss Grasu‘s place but, after today, it appears there’s still much work to be done. Sure it was sloppy, sure there were a lot of penalties but, hey, it’s the Spring Game. The quarterbacks play touch football, for goodness sake. There was a lot of room for improvement, but there were also some great flashes from key youngsters. The Ducks look strong at WR, especially considering they’re not even at full strength, yet. It’s spring — take everything you saw and read about today with a grain of salt.